Not much sewing has been happening around here lately. In fact, none at all for over a week. Why? 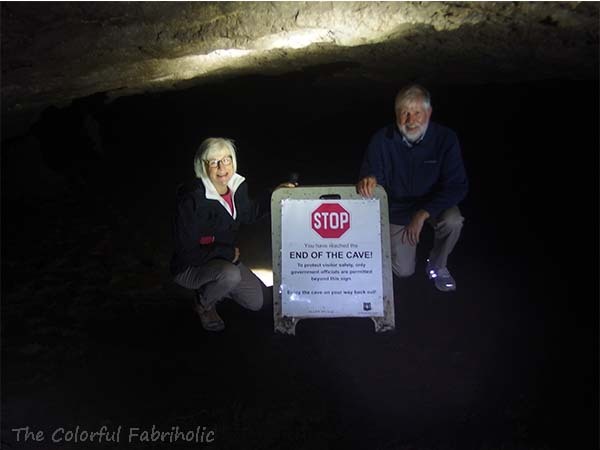 Because my husband and I were vacationing in Oregon. We live in Missouri so there was lots of new and different sights to see and things to do there. 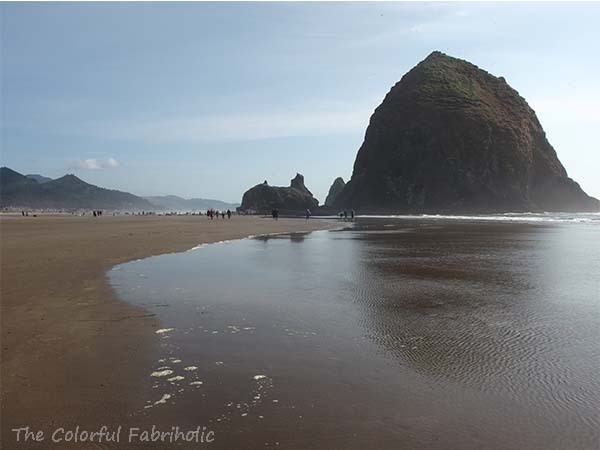 We spent a couple days at Cannon Beach and were there on eclipse day. The totality there was 98.4% and we got lucky, no fog where we were. 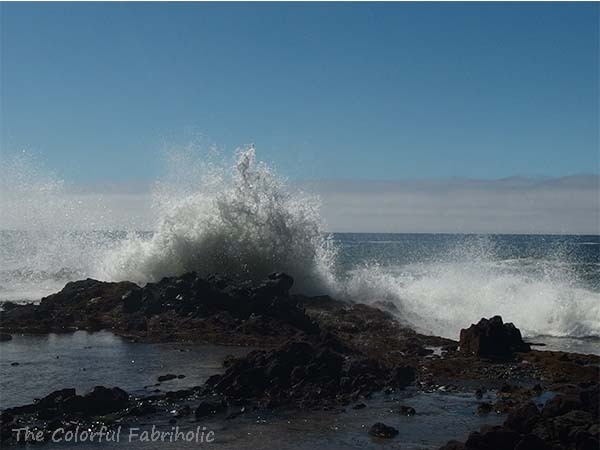 The Yachats area was one of our favorite parts of the trip. 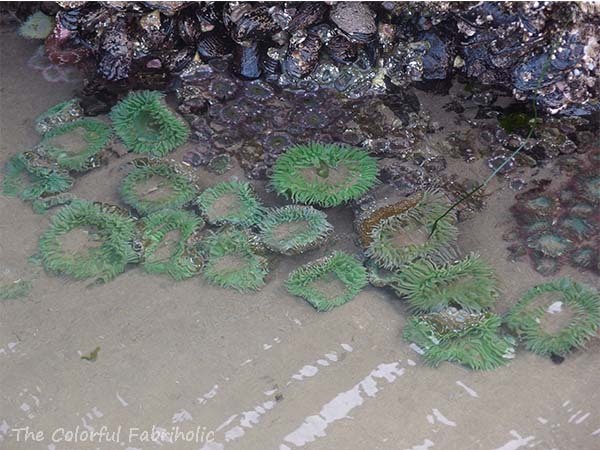 We played around on the rocks and poked in the tide pools at Cape Perpetua. There were no starfish at Cannon Beach; they've experienced a 95% die-off there. 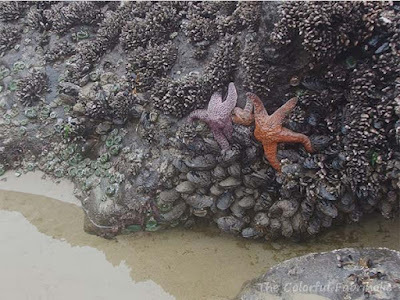 It was a relief to see some starfish at Cape Perpetua to know that they're not all gone everywhere. 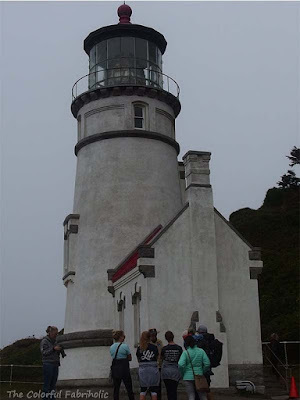 We visited Heceta Head light house but due to maintenance issues the tower is closed to visitors. Volunteers give a short talk about the history of the light house and the lifestyle of the keepers, and answer visitors' questions. It's still an operational light, now fully electrified and automated. Although seeing Crater Lake was supposed to be the highlight of our trip, smoke from the nearby wildfires prevented us from actually seeing the lake. The camera captured more in this photo than we could actually see. 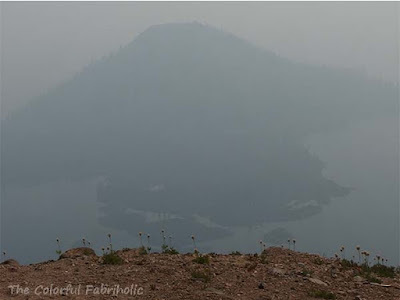 Everywhere we went in central Oregon there were firefighters, some from as far away as Flagstaff. In Bend we stayed at McMenamins Old St. Francis School Hotel, which has several secret rooms and hidden passages. 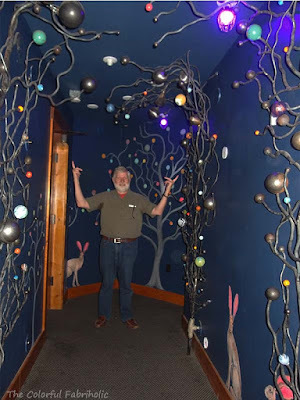 McMenamins properties are unique, very cool, and filled with offbeat artwork. This secret space has metal sculpture, metal and blown-glass ornaments, and decorative painting, including glow-in-the-dark. Near Bend is Newberry Volcanic National Monument, which has a lava tube cave you can walk in, almost a mile deep, and huge surface lava flows which include obsidian and pumice rocks. Of course we had to stop in Sisters, but I was too interested in shopping at The Stitchin' Post to take pictures. More about that in another post. 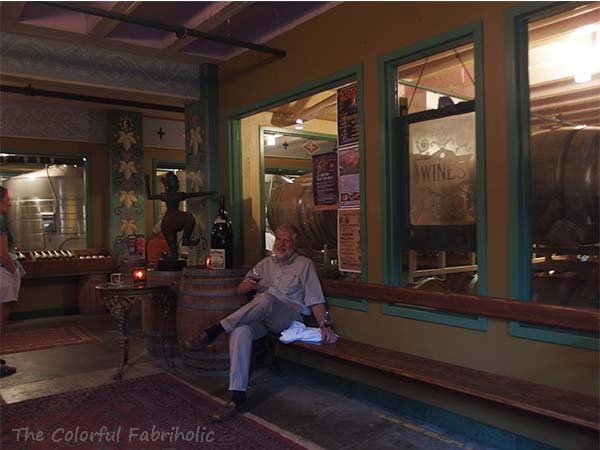 We wrapped up our trip with a stay at McMenamins Edgefield, near Portland, where we enjoyed the wine tasting and later a lovely dinner in the gardens. Now that I'm home I'm looking forward to getting back in the sewing room. But laundry and neglected household stuff has to come first. 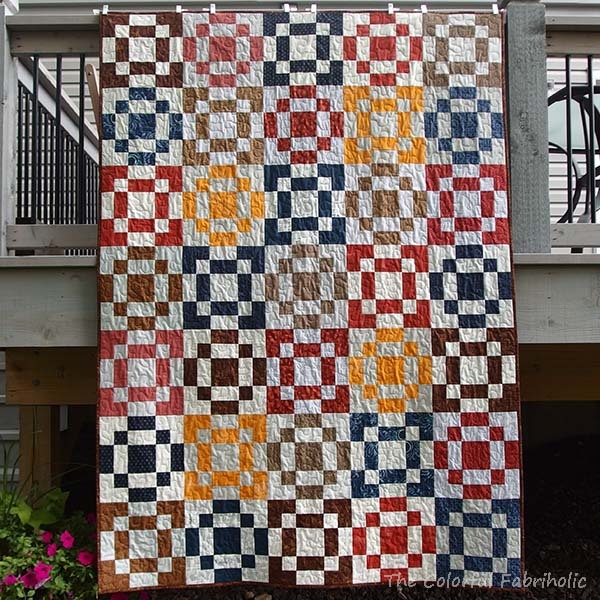 Meanwhile, I'm linking up with Let's Bee Social at Sew Fresh Quilts. 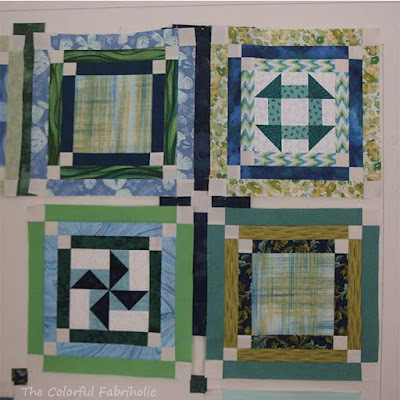 A few weeks ago I had some of the Emerald Isle blocks made and I was auditioning sashing on my design wall. I definitely want it to continue the Irish chain effect. Wanda from Exuberant Color, whose color sense I admire greatly, suggested a light sashing with the white cornerstones. I tried to find something that would work, but nothing was working for me. I like the contrast of a dark shade better, leaning toward navy. I asked my friends who are also doing this BOM at our LQS for their opinions, and they were in agreement that a dark color would be better. I found this and they all concurred. 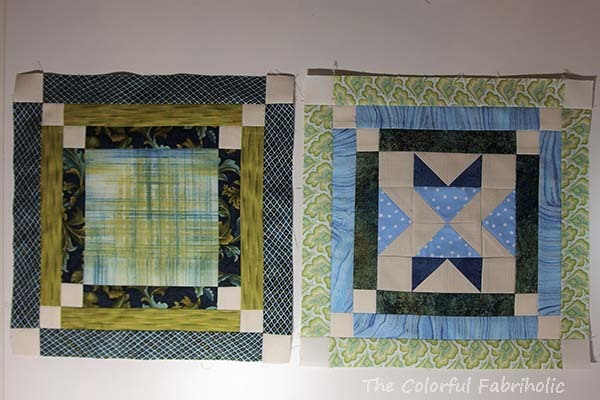 I can fussy cut the sashing pieces I need from those vertical stripes. 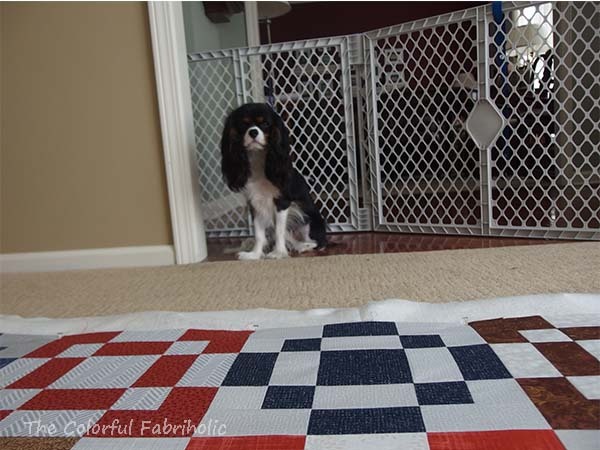 The stripey repeat is about 3/16" wider than I need, so I can cut my strips and trim away the extra darkest part. 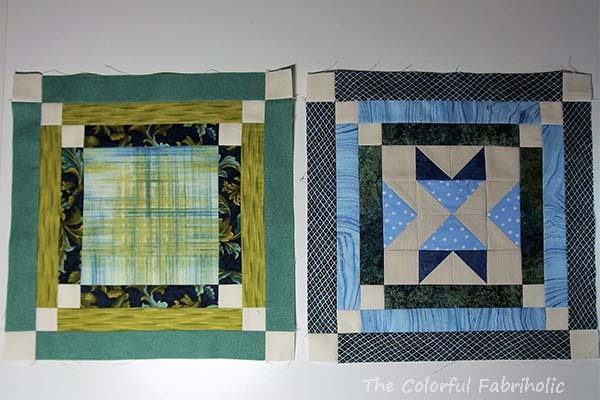 If I add a sashing strip to one side of each block, I can lay the blocks out and determine which blocks need strips on the other side. 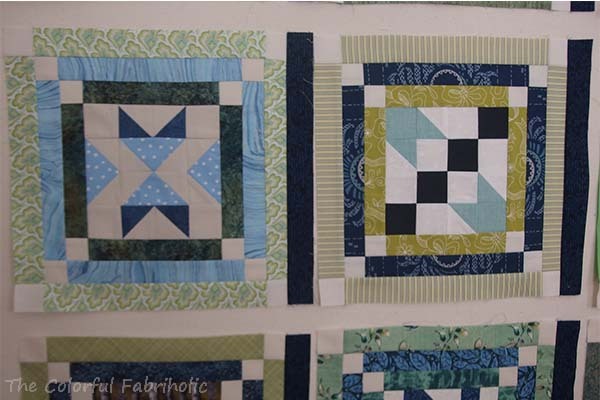 Sewing the strips onto the blocks is going to take awhile, and I have some non-quilty things going on, so I don't know how quickly I'll get the sashing done. I'll just keep plugging away at it as I get a chance. The alternate blocks are coming along, I've made a few more towards the 15 I need. I just stuck them onto the wall over the main blocks. A couple weeks ago I was concerned about the chartreuse in some of the blocks, but now that more main blocks and alternate blocks are made and more of them have that yellow-green in them, I'm not concerned, I think it'll be fine. So, back to making alternate blocks... Here are all 15, completed. 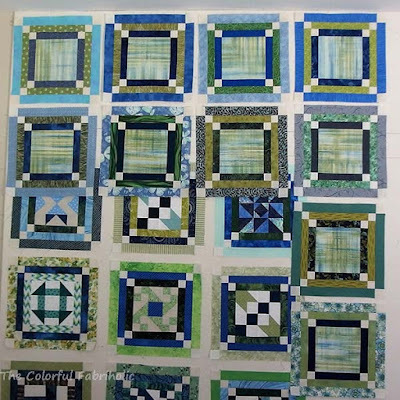 Now that Marty's quilt is finished and shipped off, I can get back to one of the projects I had planned to work on this month, Emerald Isle. Since then I've been able to finish the main blocks, the ones with pieced blocks in the center. 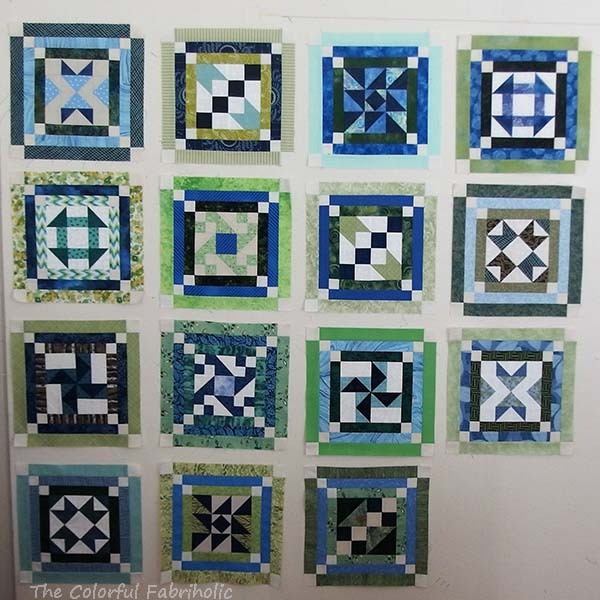 I'm planning a 5 x 6 block layout, so I need 15 each of the main blocks and the alternates. 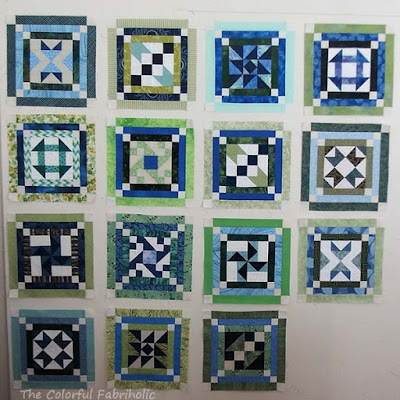 12 of these blocks were main blocks from a BOM series at my LQS. The centers of three of them were also from the BOM series, but they were supposed to be alternate blocks. I made them main blocks by adding my own frames from stash, green-blue-green. 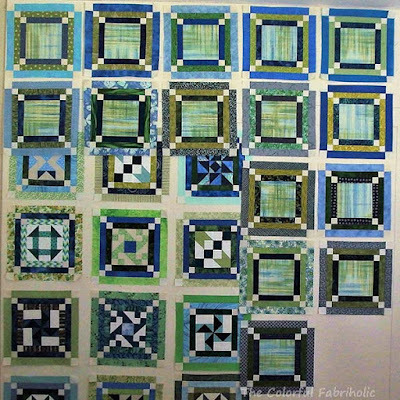 Instead of pieced alternate blocks I'm using a constant fabric for the centers, and framing them with blue-green-blue strips from the BOM alternate block kits. Time to dig into my stash and find some more blue and green prints I can use to frame a few more blocks. A couple weeks ago I started a quilt for my brother who's going through some health issues and is stuck in a rehab center until after Labor Day. 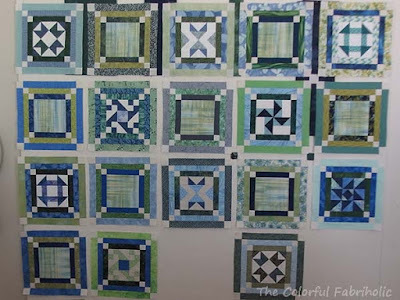 Using the Block Mama method and the Four Corners block from my book Cut and Shuffle Quilts, I made nearly 30 blocks. 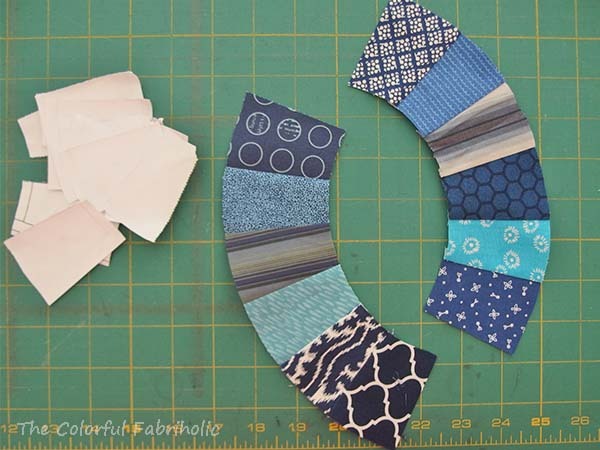 The palette of russet, tan, dark blue and light grey is nice and masculine, and all the fabrics came from my stash. 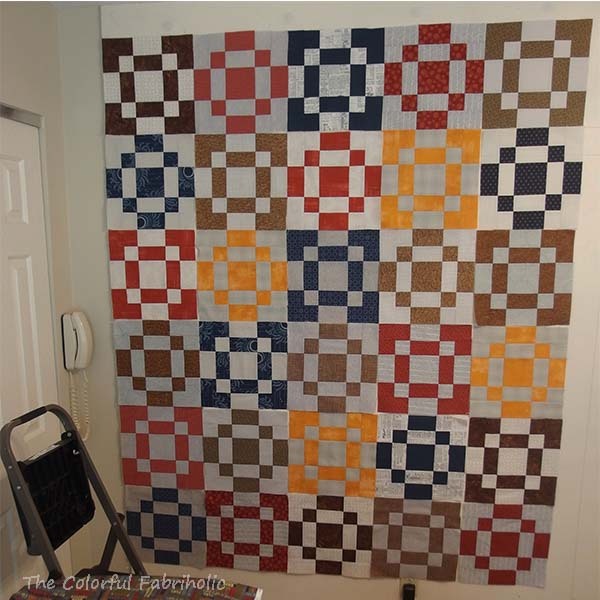 The palette needed brightening so I added light orange to the mix, inspired by the backing fabric. 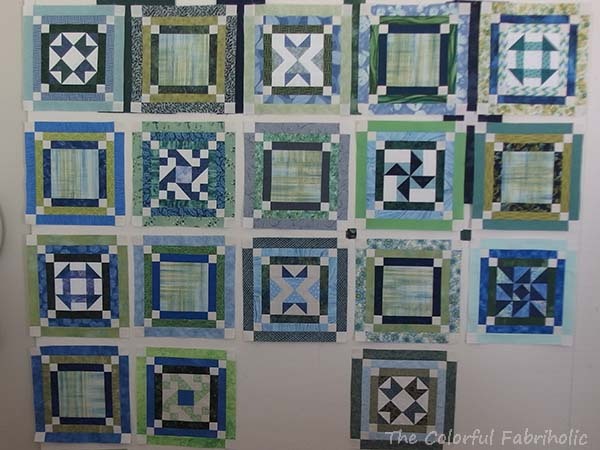 Here are some of the blocks on my design wall before I finalized the layout. 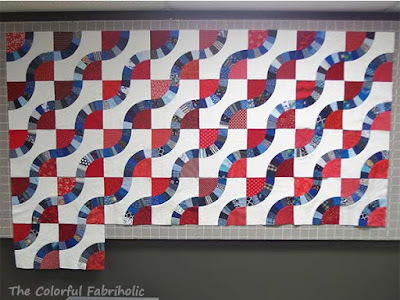 After making a few more blocks I ended up with a 5 x 7 block layout, 60" x 84". 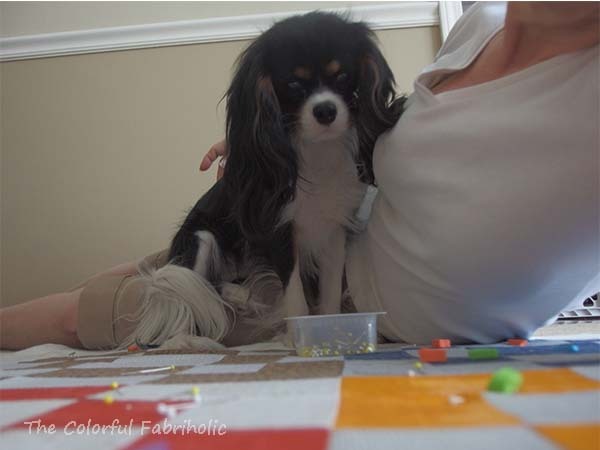 Then Murphy helped me pin-baste the layers together. 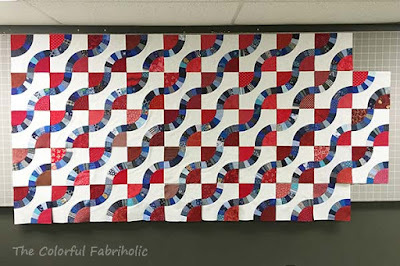 I quilted a simple allover meander, about the extent of my FMQ skills. 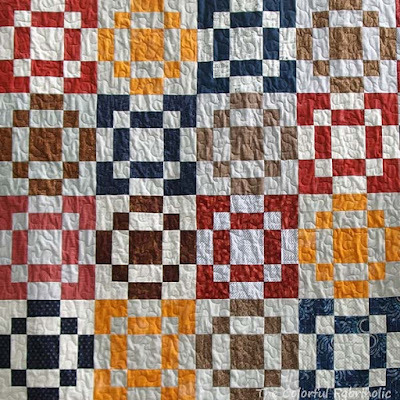 The quilting was accomplished within one day and the quilt remained soft and drapey. I used Aurifil 50 wt, in a medium grey #2610. I finished it off with machine binding in the darkest brown, with a label tucked into the binding seam. 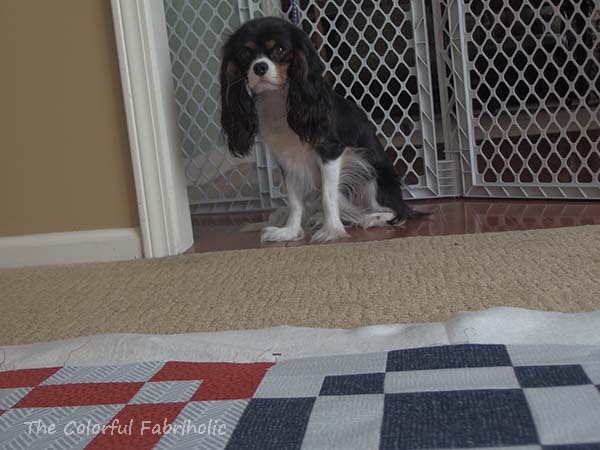 Now Marty's quilt is not only finished, it 's already on its way to him in Arizona. The fabrics are all from stash except for the backing, which was purchased with Marty and this quilt in mind. 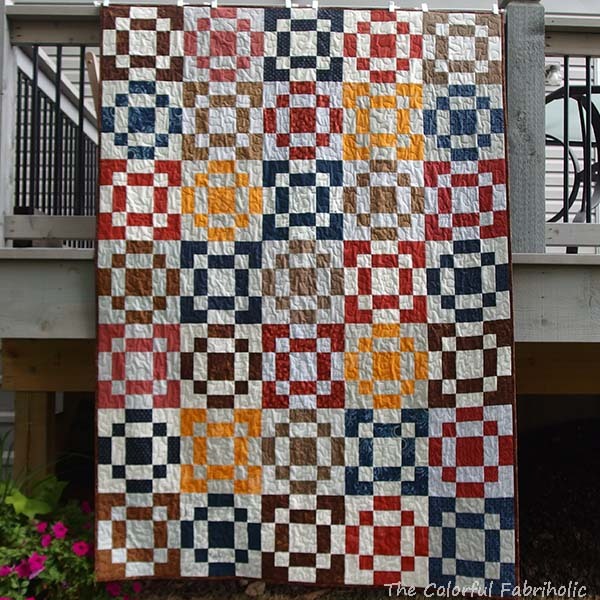 Some quilts look better in real life than they do in photos, and this is one of them. All the prints have a lot of texture or small scale pattern going on, but you can't really see the some of the prints in the whole quilt photo. 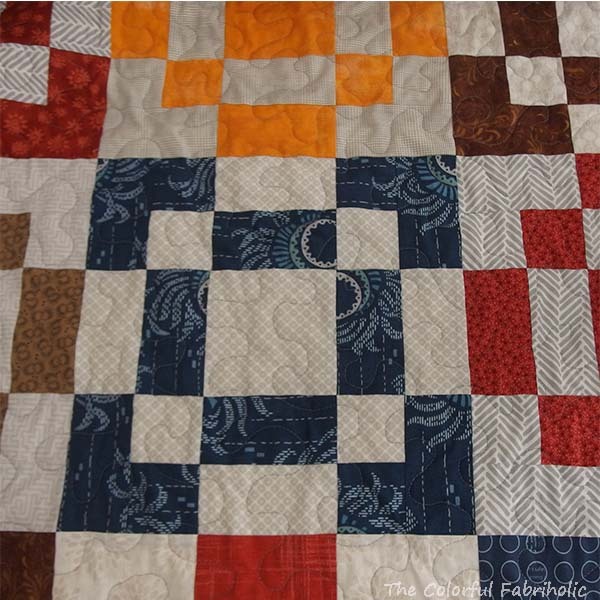 Here you can see the texture created by the quilting. In the photo below you can see some of the small scale prints. The light orange is Grunge. 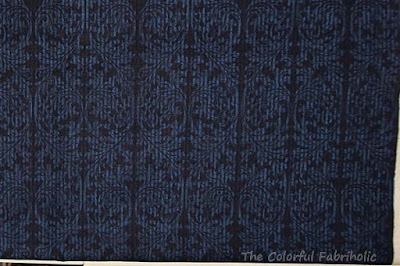 This blue print is the largest, boldest print in the whole quilt. 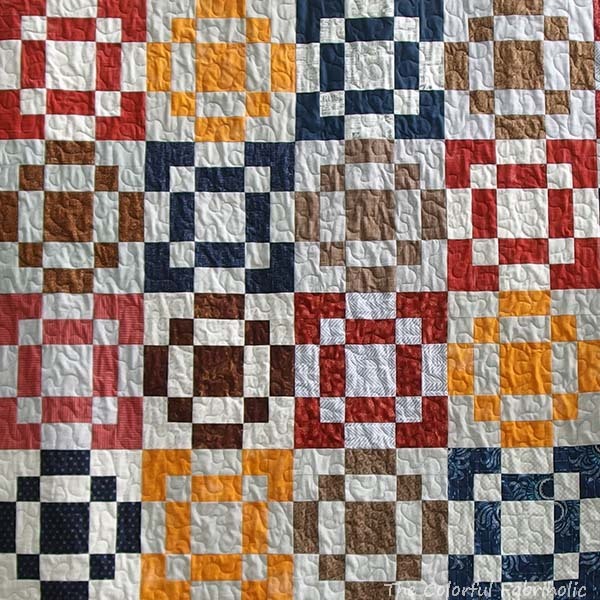 The two russets were purchased several years ago in Texas when DH wanted me to make him a cowboy quilt. So Marty's quilt is on its way to him, in care of his daughter who will take it to him in the rehab center. It should arrive next week. I hope he likes it. This is by far the fastest I've ever made a quilt from start to finish. I don't remember what day I started working on it, but it was definitely after the first of August. 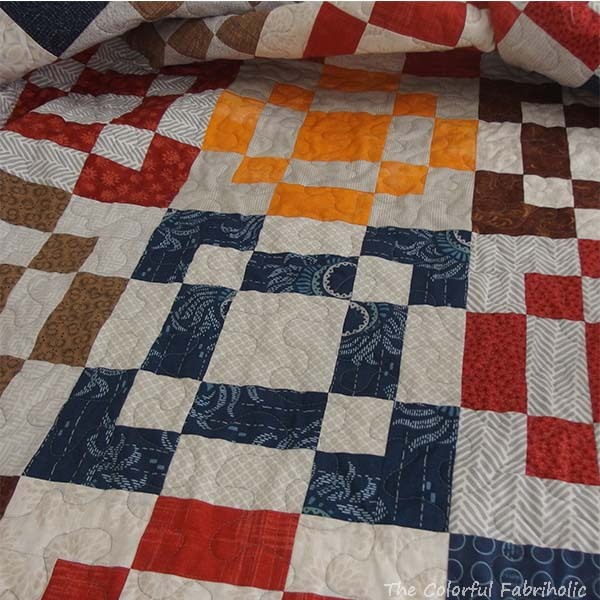 He doesn't need a quilt in Arizona in August, but he can sure use a quilty hug, so this one's on its way to him. Mom is doing that thing on the floor in the dining room again. She moved all the furniture out and she left the gate open. I wonder what's in there? She never lets me in the dining room. She hasn't chased me out yet, maybe I can sneak in and see what she's doing. Mom's on the floor! Oh boy, oh boy, oh boy, lap time!!! Mom and Dad only let me sit on their laps when they're on the floor. She's on the floor so she's mine!!! I can sit here while she does whatever with those pin things. She sure isn't making much of a lap for me, but she has to reach over me for her pins, so I get extra hugs in the process. Oh, mom doesn't want me in her lap now after all. Sigh. 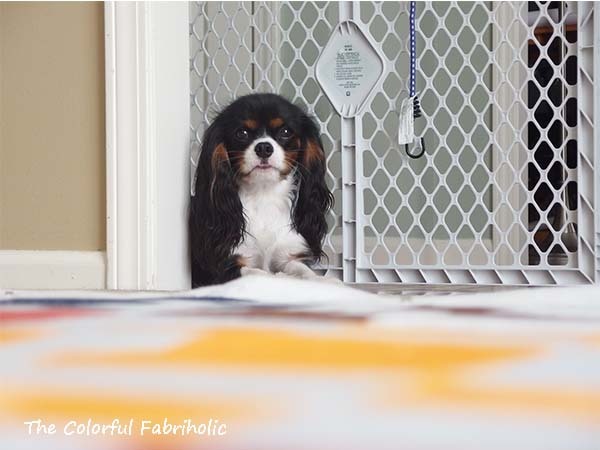 Maybe if I just stay here on the wood, not the carpet, mom will at least let me stay on this side of the gate. In her lap would be better, but at least I can stay here nearby. 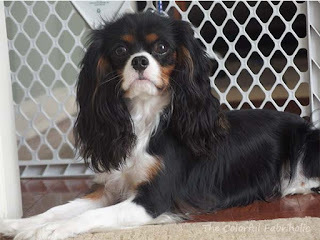 Do you think my ears are big? Mom thinks they're huge. I'm 13 months old now, and I still haven't grown into my ears. That's okay, they make me cute. Mom finished up whatever she was doing with those pins and carried the whole fabric thing up the stairs. Dad says her sewing room is up there. I'm not allowed up there so I don't know.... Mom will show us that fabric thing later, when she's done with whatever she does to it in the sewing room. Now we have all 48 blocks done!!! When I last posted about this back in March, several people asked me for a tutorial. 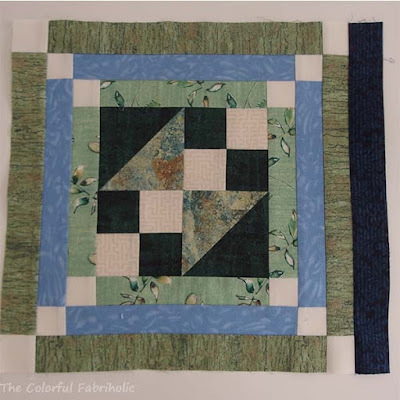 The snake block/quilt is a traditional pattern which Barbara Brackman discusses here, dating from the 1930s to the 1960s. In her post she mentions that she cannot find a commercial pattern for it. 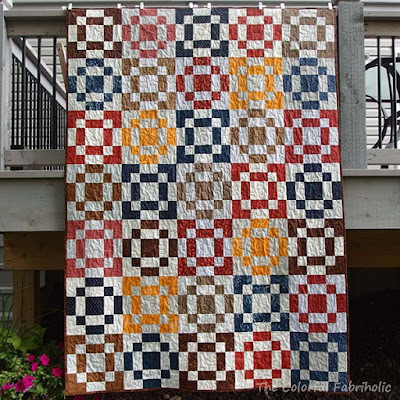 There is a similar quilt called Snake Trail in Denise Schmidt's book Modern Quilts Traditional Inspiration; Denise's block size, proportions, corners, construction methods, and pressing differ from mine. 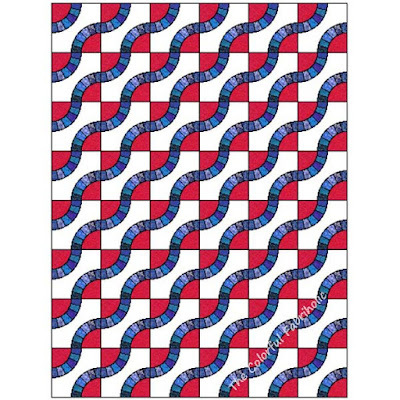 The snake block is a very challenging block even for experienced quilters, and it requires templates. Here's a tutorial for how I made our templates and how my friends and I made our blocks. Our block is intentionally made slightly oversized and trimmed down for accuracy. Our block finishes at 10", and requires both paper piecing and sewing curves. 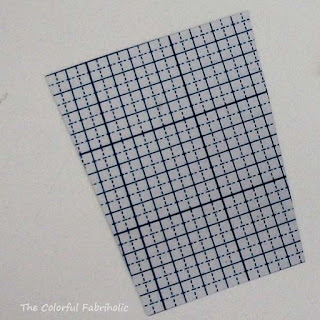 Draw a 10" square on the graph paper. 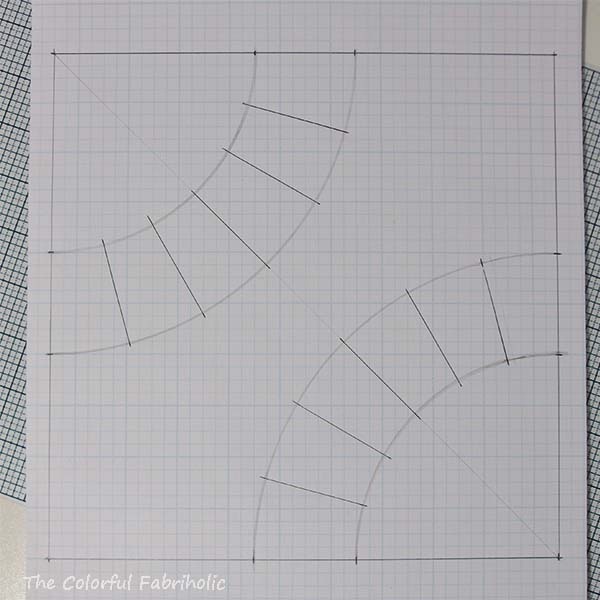 Make a mark on the outline 4" from each corner on all sides. 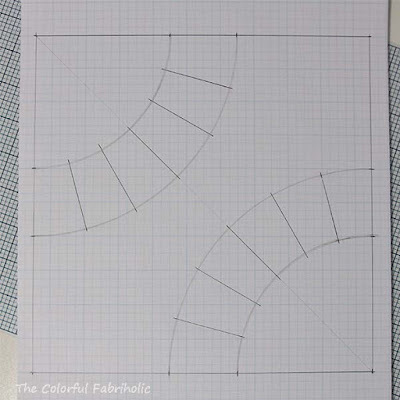 Using the compass set at 4 inches, draw arcs in two opposite corners. Reset the compass at 6 inches and draw larger arcs outside the first ones. Note that the ends of the arcs are on the 4" marks you made earlier. If they’re not exactly at these 4" marks, redraw the arcs. Lightly draw a diagonal line from the same corners. Draw it more heavily within the arcs and erase the rest, but make sure marks show a little on the background and corner pieces. From the same corners, draw diagonals within the arcs as shown, like spokes, spaced as evenly as possible. Make sure the lines extend past the curved line of the arc because these marks serve as match points. 8. 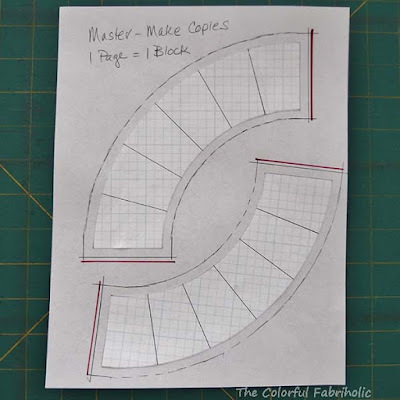 Very carefully and accurately, cut your drawing apart to separate the arcs from the center and the corners. Do not cut the arcs into little pieces. - Note: These pieces do not have seam allowances. Lightly glue both arcs to a piece of plain printer paper, allowing 1/2" clearance on all sides. 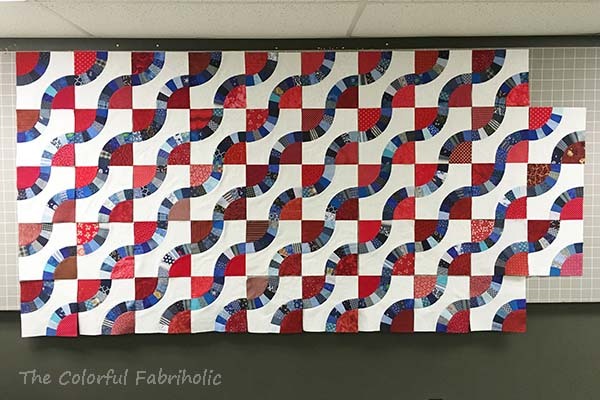 Draw 1/4" seam allowance all the way around each arc, using the Add-a-Quarter ruler or any ruler that gives you an accurate 1/4". Make sure the lines at the ends of the arc are perpendicular to the edge. Tip: Add additional 1/8" to the ends, shown here in red. 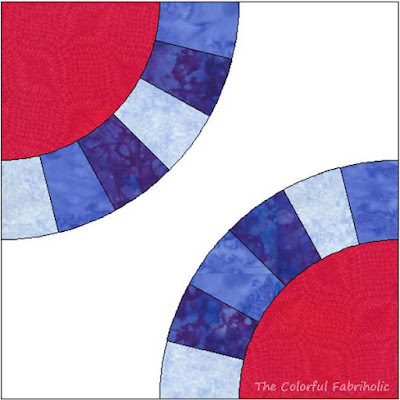 Make copies for paper piecing; one page will make two arcs for one block. Lightly apply glue stick around the outside edges of the background piece. The moisture makes the paper stretch, so keep the glue only at the edges and work quickly. Glue the paper down to template plastic, making sure you have 1/2" of plastic all the way around. 5. Mark match points where the seams in the arc will align. 6. Carefully cut out the plastic template. 7. With sharp scissor points, notch the match points, cutting about 1/8" into the seam allowance. 8. Repeat steps 1-7 for the corner piece; make only one corner template. Tip: It’s better to make the block slightly oversized and square it up to 10-1/2" after it’s sewn. Therefore I recommend adding 1/8" to the outside edges of all block pieces. 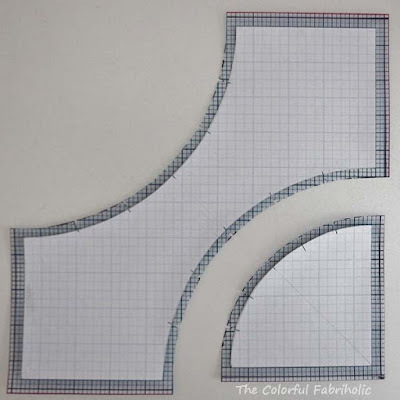 on both templates and the paper piecing foundation. * I used a Sharpie marker for this step so the lines would show in the photos for this tutorial. Never use Sharpie with any templates or rulers in your sewing studio. Some of the ink gets on – and stays on – the edge of the ruler or template. Some marking pens, such as water-erasable markers, dissolve the permanent ink of the Sharpie and allow it to bleed onto the fabric being marked. It’s permanent. 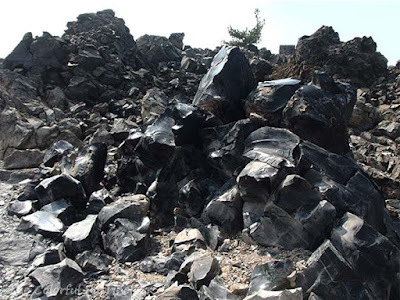 It will never wash out, and your project may be ruined. Keep all permanent markers away from your sewing! Mark a piece of template plastic 2-1/2" x 3". Draw a tumbler shape: With the plastic in portrait orientation, make marks on the bottom line 3/8" in from each corner. Draw a line from the top corner to the bottom mark on each side, creating a tumbler shape. Cut out the plastic template on these lines. Cut six plastic pieces exactly this same size. Glue them together in a stack. Make sure the edges are exactly aligned when you add each layer. Six layers is sturdy enough to use with care with a rotary cutter (the blade will cut into fewer layers). The background template requires 12" of fabric, 1/3 yard. 4 background pieces can be cut from one 12" width of fabric. 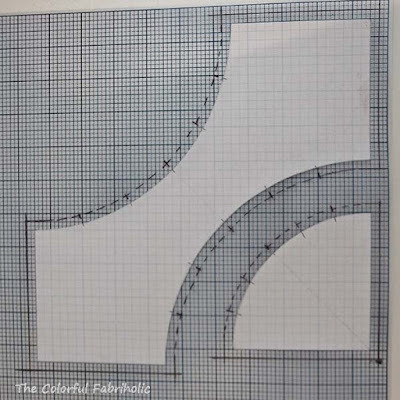 On the wrong side of the background fabric, align the graph paper lines of the background template with the grain line of the fabric and carefully trace around the template. Mark the match points on the fabric so they’re visible on the wrong side of the fabric. Cut out the background fabric, making sure the match points are visible. Be sure to keep the extra 1/8" on the straight sides. 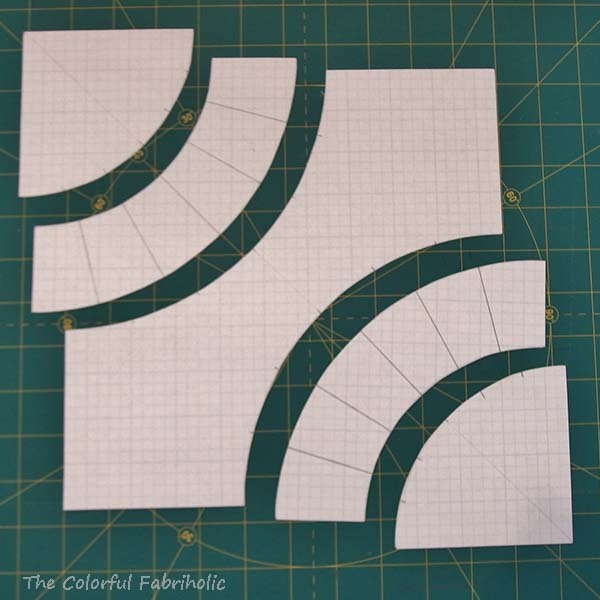 For a 6 x 8 block layout (60" x 80" top) cut 48 background pieces. 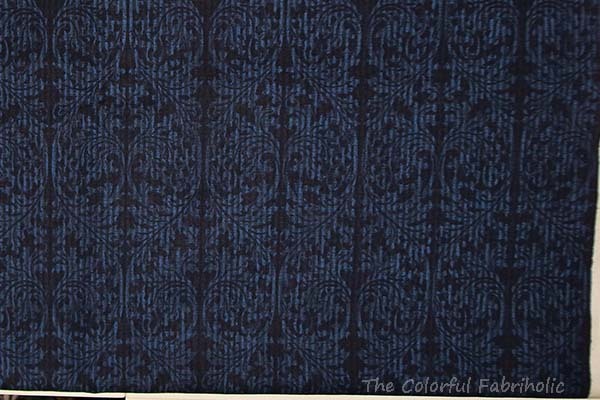 If using all one background fabric, 4-3/4 yards are needed. The corner template can be cut from yardage, scraps, or from a 5" charm square. 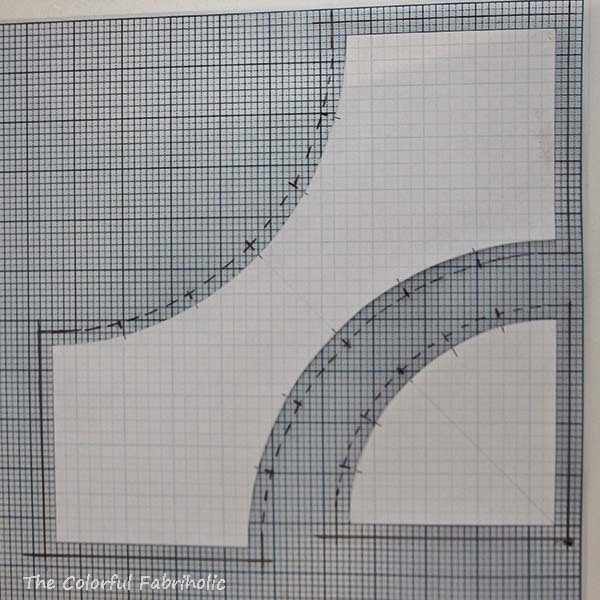 On the right side of the corner fabric, carefully trace around the corner wedge template, keeping the graph paper lines aligned with the grain of the fabric. Mark the match points on the fabric so they’re visible on the right side of the fabric, for matching up with the arcs later. Cut out the corner fabric, making sure the match points are visible. Be sure to keep the extra 1/8" on the straight sides. For a 6 x 8 block layout (60" x 80" top) cut 96 corner wedges. If using all one fabric for corner wedges, 1-5/8 yards are needed. The tumbler-shaped cutting guide can be used with 2-1/2" pre-cut strips of fabric to cut pieces along the length of the strip. 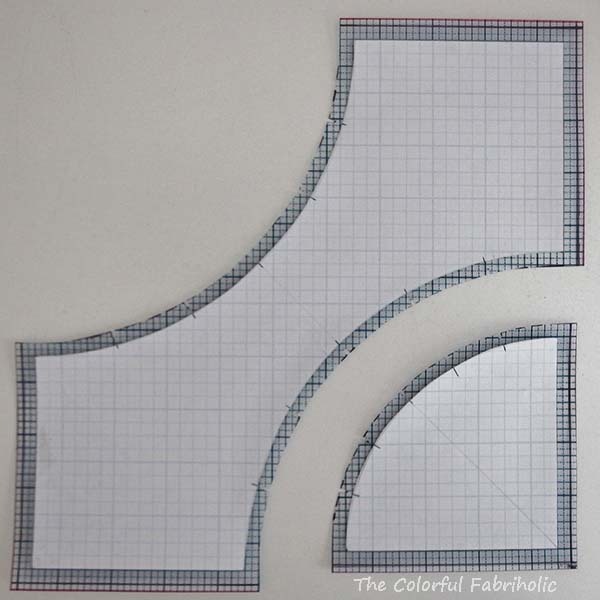 Or use the cutting guide with 3" strips of fabric and rotate the template up and down for each cut for less waste. Stack strips or scraps and rotary cut to save time and fabric. For a 6 x 8 block layout, 288 pieces are needed, the more variety the better. Cut the two arc foundations apart and work on two at a time to chain piece. 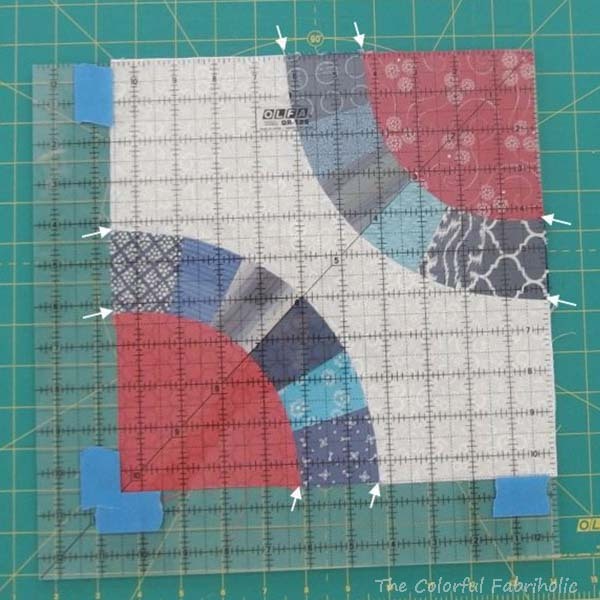 Pre-fold the sewing lines for easy alignment of pieces. Put two blue pieces right sides together, wrong side to the back side of the paper foundation. Sew on the first line, open the fabric, and press. 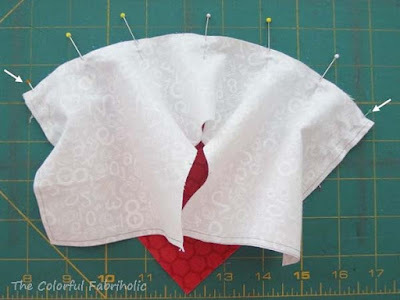 Fold back the paper on the next line; trim the fabric 1/4" away from the folded paper. Align the next blue piece right sides together, and sew on the next line. Repeat steps 4, 5 & 6 to complete the arc. Cut on the outer cutting lines. Be sure to keep the extra 1/8" at the ends of the arcs. 1. 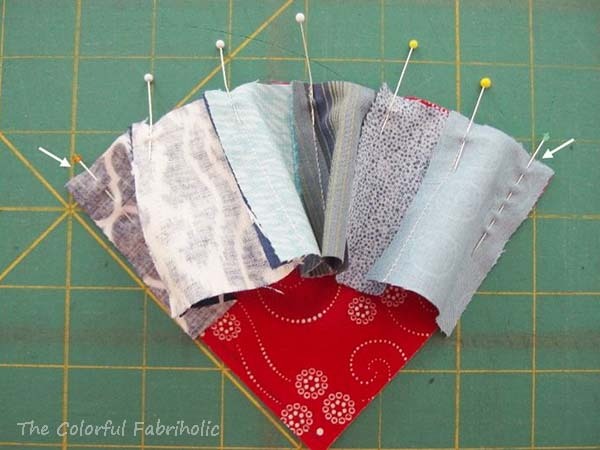 Pin an arc to a corner, matching the arc seams to the marked match points, pinning ends and match points. Sew with 1/4" seam. Sewing with the concave arc on top is recommended to ease it onto the corner wedge. Repeat for other corner. Tip: align edges and use a pin to “stitch a seam” (see arrows) which will prevent the ends of your arcs from swinging outward; this helps keep the arc seam perpendicular to the edges of the block. 2. Pin center background piece to arc, aligning ends and matching match points to seams in arc. Sew with 1/4" seam. Piecing with the concave background on top is recommended to ease it onto the arc. 3. Repeat to attach center to other arc. 4. 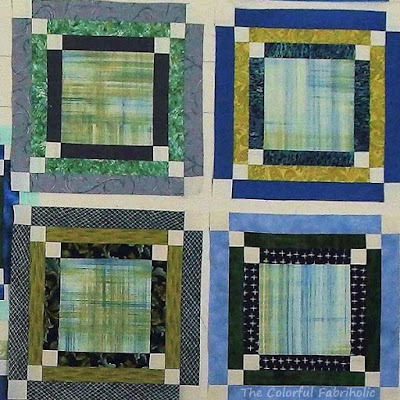 Press all seams toward the corners, away from center background piece. 5. Square up and trim the block to 10-1/2", making sure all the ends of the arcs are as close as possible to 4-1/4" away from the corners, shown by the arrows in the photo below. This assures that the arcs will line up smoothly and create the snake-like effect when the blocks are set together. 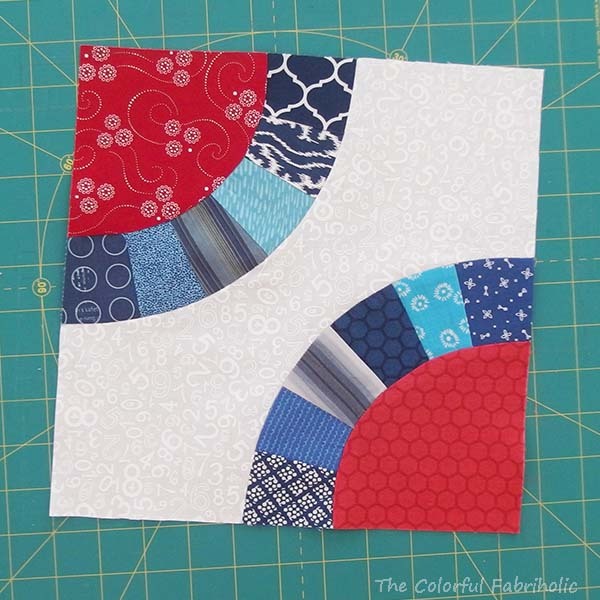 Note 1: If the block comes out wavy or seems to ripple, you may have taken too scant a 1/4" seam when attaching the background center to the arcs. 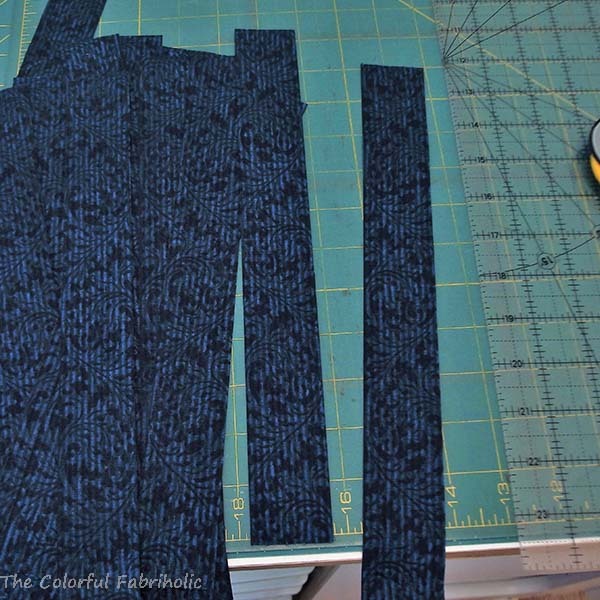 Try increasing your seam allowance by one or two thread widths to eliminate the excess waviness. Do this before trimming and squaring up, while the block is still oversized. Note 2: When sewing blocks together in the traditional layout, the seams will nest. Match seams and pin carefully for smooth transition of snake-like arcs from one block to the next. 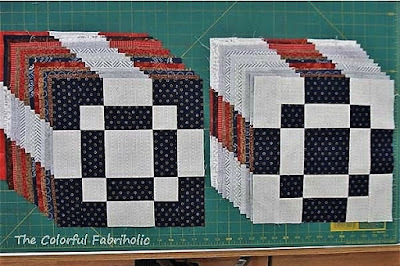 For alternate layouts such as loops, the seams of some of the blocks may need to be re-pressed to get the seams to nest. Note 3: If you make a Snake Quilt as a group project, I strongly recommend that you use one set of templates for all the blocks rather than lots of individual sets of templates. 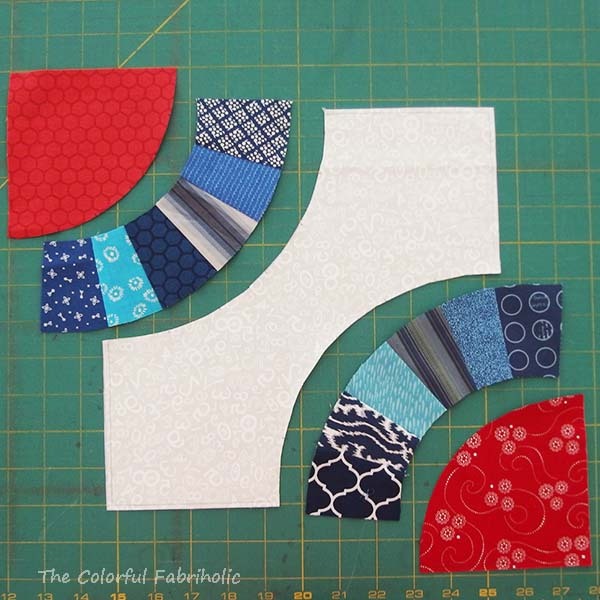 Just like everyone’s quarter inch seam differs, everyone’s templates will come out just a tiny bit different. If you would like a PDF of this tutorial, please leave a comment and be sure to include your email address. Welcome to my blog! I'm Jan Ochterbeck of St. Louis Missouri. Wife, mom, grandma. 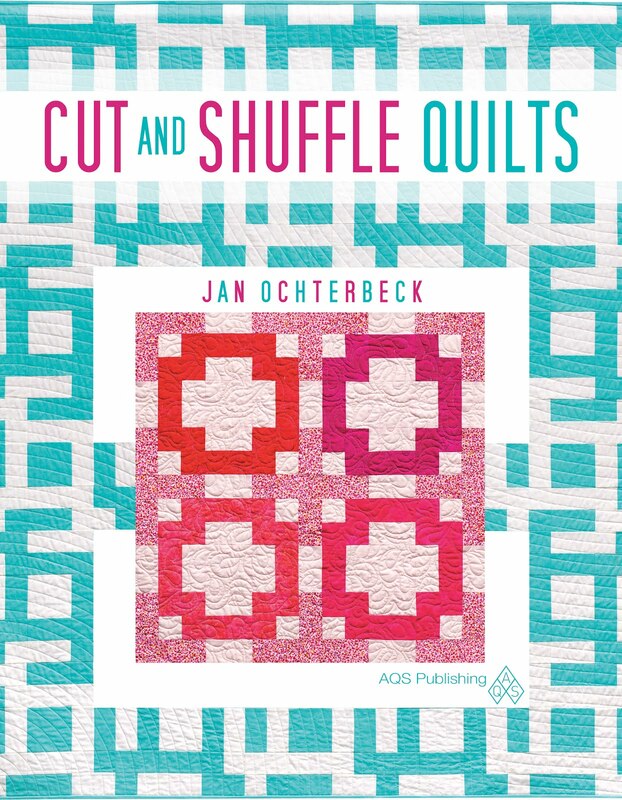 Quilter, pattern designer, and author of Cut and Shuffle Quilts. Former apparel / textiles / footwear product development professional specializing in color. 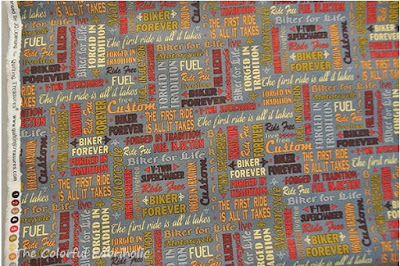 Lifelong fabric addict. Now pursuing my quilty life and exploring new possibilities. All images and text on this blog copyright Jan Ochterbeck.... Simple theme. Powered by Blogger.